Given my aversion to work in the kitchen, one of my favorite parts of this project has been the work of interviewing my grandparents. 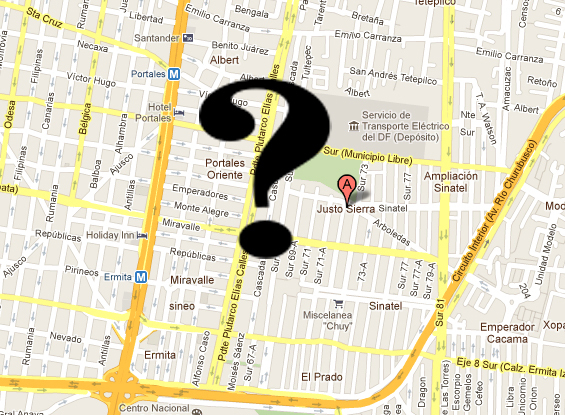 And since both sides of my family have roots in Mexico City, I’ve been able to do a little sleuthing by cross checking their memories. A few months ago, my mom’s mom, Martha, who was born in Hungary, was reminiscing about Jewish food that she used to eat in Mexico City. She had the recollection of a restaurant around Justo Sierra — a street in downtown DF (El Centro) — that her Hungarian mother, my great grandmother, used to eat at to get her fix of Eastern European food. The only problem — she couldn’t remember anything else. Not the name of the place, not the food that was served. 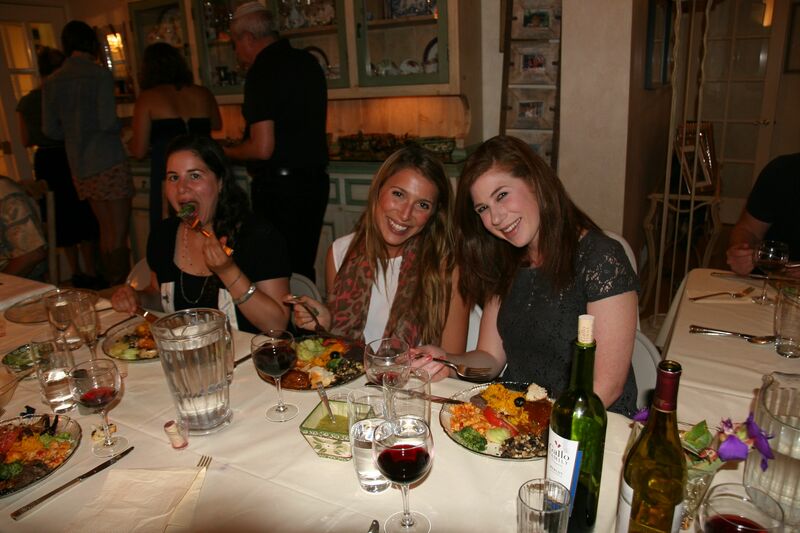 The restaurant was originally a synagogue called Nidjei Israel. The caterer and his wife were named Motele and Etel Shlejter, and they’re the very people who prepared the food for my paternal grandparents’ wedding. They made such amazing food that they eventually decided to open a restaurant on the first floor. According to my Bobe, Dora, “This woman cooked like a queen.” She made chicken soup with kreplach (dumplings) or lokshen (noodles), baked meat and chicken, cabbage borsht, kishke (stuffed tripe), carrot and plum raisin tsimmes (a dessert dish made with dried fruit). But the thing Bobe remembers most clearly is the stuffed chicken necks that Etel would cook. In the States, it’s difficult to find chickens necks with the skin still on, so bobe has never made it for us when she’s come to visit in Los Angeles, and for one reason or another, she’s never made it when we’ve been in Mexico. But she’s offered to make it the next time we ask. The Jewish community in Mexico City was fairly small when my grandparents were young adults, so it’s not unusual to discover shared memories like this one. As we write the book, I hope to dig up many more. 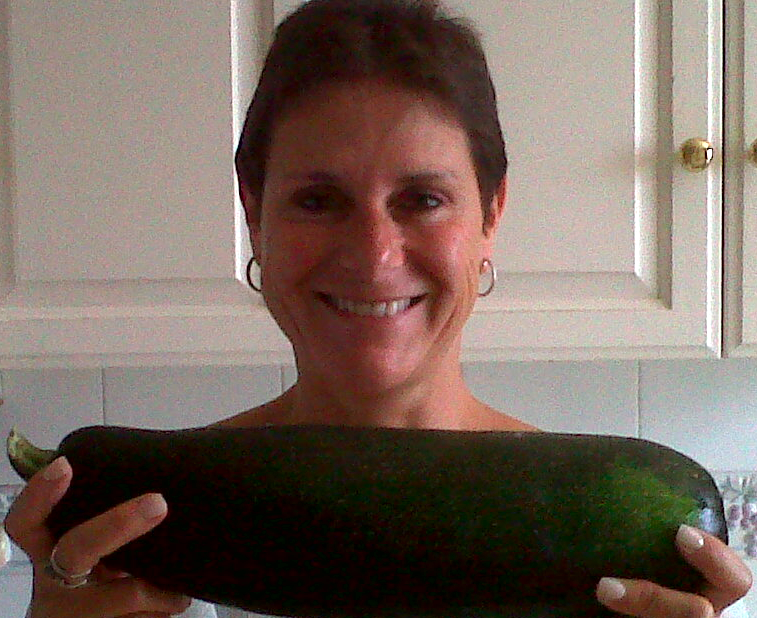 My daughter Ariela went to a friend’s ranch last week and she brought home a freshly-picked giant zucchini. This inspired me to make something I hadn’t made in a long time. It is a wonderful summer or fall vegetarian dish infused with the rich and smoky flavor imparted by two roasted Pasilla chili peppers (the type used in making Chile Relleno). While not very spicy, these peppers add a lot of flavor to the dish. This recipe can be made with giant or regular zucchini, or it can be made with the smaller white Squash, also known as Mexican squash, which can be found in farmers markets or any supermarket. This weekend I made two versions: one using the giant zucchini, and the other using the Mexican/white squash. There is a definite difference in the end result in terms of taste and texture, but both versions are delicious. The giant zucchini has a more starchy, pumpkin-like consistency, while the white squash is a bit more firm. Both go beautifully with the peppers, corn and tomatoes that are currently in season, so go ahead and give either one a try. If you use the giant zucchini you MUST peel it, but not so the smaller type. I served it over a bed of white rice for a light, end-of-summer supper, but it can also be served as an hors d’oeuvre with tortilla chips, or on a tostada (a pan-fried crispy tortilla). Roast the Pasilla chili peppers by placing them directly in a dry, non-stick griddle or frying pan over a medium stove-top flame. As the peppers brown, you will hear slight popping sounds. With a pair of tongs, flip them gently until the skin is charred on all sides. Remove them from the heat, place them in a plastic supermarket bag, seal the bag and set it aside for 10 minutes. This will allow the skin to loosen. While the chili peppers rest, prepare the other vegetables; if you’re using the giant zucchini, peel it, cut it in half lengthwise and, using a spoon, remove the seeds and any pumpkin-like fibers from the center. Cut the zucchini into 1/4 inch pieces and set aside. Slice the onion and the shallot into strips, and thinly slice the garlic. Dice the roma tomatoes, retaining their natural liquid. 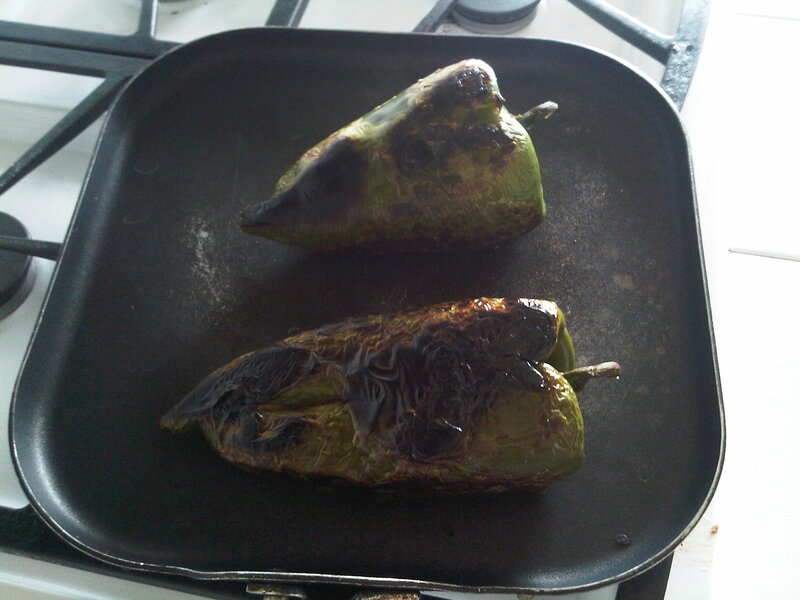 Remove the Pasillas from the bag and peel the charred skin off of the peppers (it should come off easily). Gently open up each pepper, and under running water, rinse away the seeds and any remnants of skin, and then remove the stems. Slice the peppers lengthwise into 1/4 inch strips. In a 12-inch skillet or larger, heat the olive oil on a medium-high flame. Add the onions and stir until they become translucent. One at a time, and stirring after each addition, add the Shallots, the sliced garlic, and the strips of Pasilla chili pepper. Add the zucchini and stir constantly for about 2 more minutes. Lower the flame to medium and cover for 5-7 minutes. One at a time, stir in the corn kernels, diced tomato, salt, pepper and oregano. Cover for another 5-7 minutes. The dish is ready when the zucchini and corn are tender. Choose your accompaniment, and serve hot. I have a lot of will power. I can go on a no carb diet for 2 years, but I have to make one exception. Don’t take away my tortillas. I’ve tried going for a period of time without eating them, but the joy just goes out of life when I do. To me a perfect lunch is two tacos made by warming up two corn tortillas directly on the stove top flame, and rolling into them some leftover chicken from the night before, with a bit of Pico De Gallo (a combination of chopped tomatoes, onions, cilantro and Serrano chili peppers), or a slice of avocado, a slice of tomato and a sprinkling of salt. 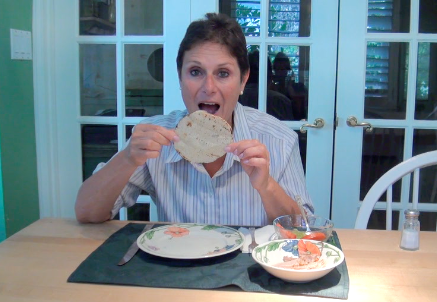 I love tortillas as much today as I did when I started eating solids. As a child, I could eat a warm tortilla with just about anything. A little bit of salt, perfect; a little bit of butter, yummy; with a scrambled egg or some re-fried beans, a work of art. One day when I was very little , after lunch, we were having orange flavored Jello for dessert. I announced to my mother “I want a Jello taco!” “We don’t eat Jello in tacos, that doesn’t taste good, my sweetie.” My mother said. “Please please,” I insisted and didn’t let up until my mother said, “I’m letting you have your Jello taco on one condition, that you finish the whole thing. “I will mommy, I will, thank you!.” They brought me my tortilla and as my mother and brothers watched, in disgust, I cut my squiggly orange dessert into little squares, lined them up in the center of my tortilla, rolled it up and excitedly went for my first bite of orange Jello taco. As I bit in, I already knew I was in trouble. This was the worst thing I had ever tasted in my life. I put it down, lowered my head, and in a very soft voice, asked my mother if I really had to eat it all. My mother said, “I warned you, why don’t you believe me when I tell you things, no, you have to try them for yourself no matter what don’t you? This is what happens when you don’t listen. Now go ahead and finish your taco!” My brothers, enjoying this spectacle, giggled to each other while I slowly picked up the enemy, which by now was a sticky cold and stiff orange streaked tortilla, with semi melted Jello leaking from its front and back. With my second bite I gagged so deeply, that for fear I would throw up, my mother said I would be pardoned from eating the rest. That was the first and last time I ever ate a Jello taco in my life. 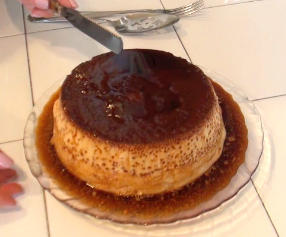 Flan is a delicious and popular dessert in Mexico….and it’s easy to make! My recipe is ideal for that special occasion that calls for a true indulgence. This Flan is a delectable treat, infused with vitamin D and Calcium in the form of those old-fashioned ingredients, milk and eggs. 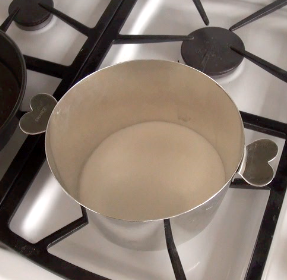 Place the sugar in a small, stove-top (oven safe), Flan making pan, and melt it over a low flame. While keeping an eye on the sugar, combine the rest of the Flan ingredients in the mixing bowl, and mix thoroughly at high-speed, set aside. By now the sugar should have started to turn golden along the edges, and you can turn the flame up to medium, stirring it frequently. When it begins to bubble and quickly becomes a rich liquid brown, remove sugar from heat. Very carefully rotate the pan, so that the burnt sugar coats the bottom, as well as 3/4 of the way up its sides. Set it aside for a few minutes, and then pour the Flan mixture into the pan. Fill the cake-pan halfway with water and place it in the oven. Then place the Flan pan inside the cake pan. Bake uncovered for 1 – 1/2 hours, remove from oven and allow to cool for 1 hour. Remove from refrigerator and loosen the edges of the flan with a knife or a narrow metal spatula. Place a dish with a slight lip over the Flan pan and invert it as you would a cake you baked. It will come out a very rich dark brown, with a nice sauce. Tamales are a delicious staple of the Mexican diet! The problem is that most tamale recipes call for lard, and of course, that is not an option for someone who keeps kosher. My solution? To make them myself. Making tamales is a labor of love that requires more steps than ingredients. In fact, 3 chicken breasts with the skin on, will cover the majority of your bases. I start by removing the skin and frying it over low heat, to render the chicken fat for use in the tamale dough. Out of the chicken breasts, I make a simple chicken stock (also for use in the tamale dough) Finally, I shred the boiled chicken to use in the tamale filling. These tamales can be made vegetarian with just the Salsa Verde filling, and by using a vegetarian soup stock and vegetable shortening instead of chicken fat. Soak the corn husks for one hour and then drain. Make double the quantity of Salsa Verde from the above linked Blog recipe. Remove the skin from the chicken breasts and render the fat. Make the simple chicken stock out of the chicken breasts by cooking the stock ingredients for 45 minutes. Cool and shred the chicken breasts (reserve the chicken stock for use in the tamale dough). Add the shredded chicken to the saucepan where you’ve made the Salsa Verde, and simmer for 5 minutes. Combine the corn flour , salt and baking powder. Slowly add the still warm chicken broth, mix thoroughly, then add the chicken fat. When all of the ingredients are thoroughly mixed, let the dough rest for 10 minutes. Take one damp (not wet) corn husk at a time, ridge side up, and spread between 3 and 5 tablespoons (amount of dough depends on the size of the corn husk) of the dough onto the wide edge of the husk. With damp hands spread the dough over and down, to cover the upper, wide half of the husk. Take 2-3 tablespoons of the chicken in salsa Verde filling and spread it in the center of the dough. Roll the husk up, fold up the skinny edge, completely encasing it in the husk. Place the tamale into an aluminum foil square, rolling it up and then rolling in the edges of the foil, so that the tamale is tightly sealed. Fill the two pots with just enough water to reach the steaming baskets. Form and place a small ball of foil in the center of the steaming basket. Lean the tamales on the ball, forming somewhat of a teepee with the tamales. Once you have filled the pot with your tamales, cover the pot tightly and steam the tamales for 3 hours on a medium flame. Make sure that the steamer never runs out of water so continuously re-fill. After three hours, remove the tamales and allow them to cool. They can be eaten fresh, refrigerated or frozen for future use. the consistency of the tamale dough will be better after they are cooled and thoroughly reheated in the microwave. A couple of weeks ago, I walked into my parents’ house on a Wednesday evening. My Mom was in the thick of Shabbat prep — she’d just finished up a plate of nockedli (Hungarian dumplings) and was moving on to kosher paella. 30 people were invited and my job was help with the seating arrangements. Why was that my role? Because I hate to cook. There’s not much to it — it’s just an activity that’s never interested me. What does interest me, however, is being fed and hosted. 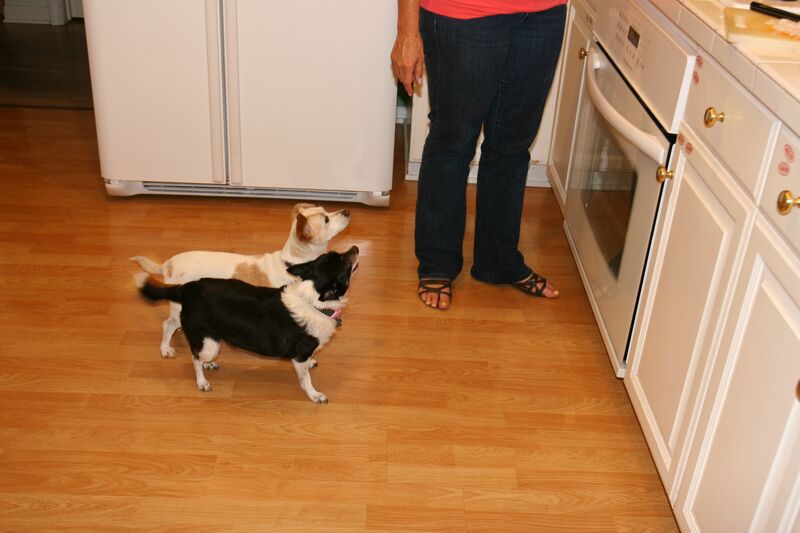 If you love to eat, is it hypocritical to hate cooking? I’ve struggled with some guilt about that over the years and helping with other tasks has been my way of trying to compensate. Let’s not kid ourselves, though: I’m doing nothing compared to her. 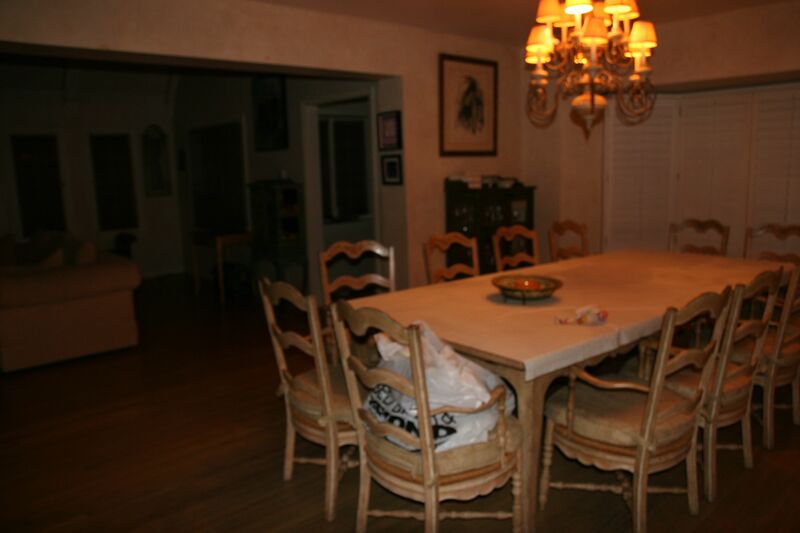 Over the years, my Mom has spent an unfathomable amount of time nourishing her family and entertaining friends. All I’ve done is help with chairs and flowers. When we decided to start on this project, I thought I’d have to hide my dislike for cooking. But then I figured there were other people in the same boat — people who hated cooking, but admired cooks in their lives, and cherished moments and memories those cooks had facilitated. So I decided to try and incorporate that perspective into the book. By writing this book, I just may convert to the cooking religion, too. The payoff, of course, will be the ability to create moments and memories for others the way my Mom has for us. So the odds are good. We all strive to eat a healthy and balanced diet. But if you or anyone in your family is like me or Alex, and you occasionally sin by eating some of the skin from a deliciously crispy roasted chicken, then this recipe is a must for you. I learned to make gribenes, from my Mother-In-Law, Dora Schmidt, and I have taken them to another level. 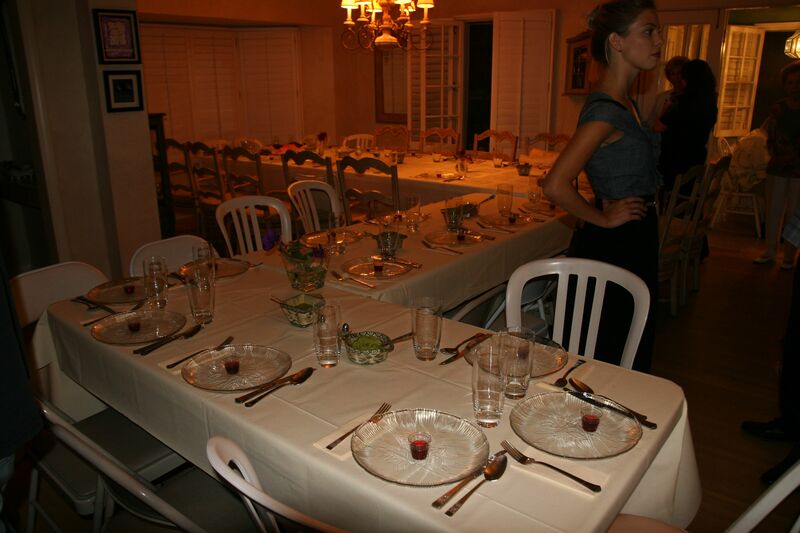 I make them just occasionally at the end of a long workweek when the family gathers for Shabbat Dinner. This is the time when we all loosen the reins and indulge. 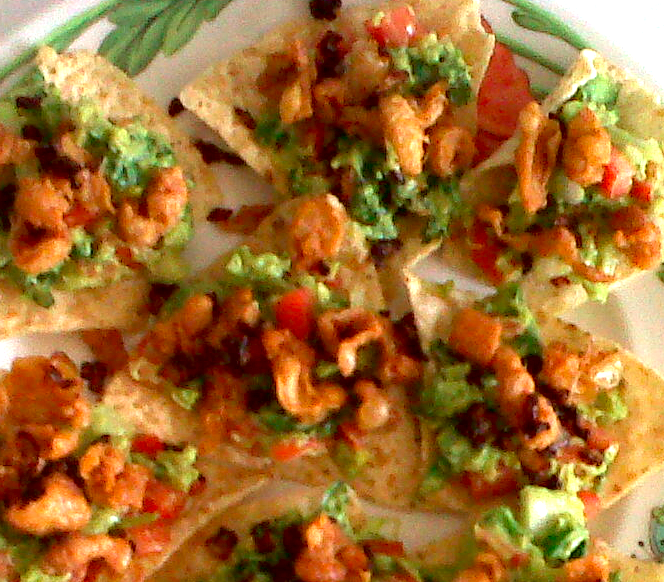 I prepare this recipe as a decadent appetizer, in the form of a tortilla chip and guacamole, topped with crunchy gribenes and golden onions. Gribenes or grieven (Yiddish: גריבענעס, [ˈɡrɪbənəs], “scraps”) are crisp chicken or goose skin cracklings with fried onions, a kosher food somewhat similar to pork rinds. Gribenes are a byproduct of schmaltz preparation. Cut the chicken skin into small pieces (about 1/4 inch) with kitchen shears, and place them in a shallow non-stick frying pan. Remove the gribenes from the pan, Leaving about a Tablespoon of the schmaltz ( chicken fat) in the pan, drain the rest of the schmaltz and pour it into a glass jar, and reserve it in the freezer for future use (such as in the making of tamales). Add the 1/2 onion to the still hot schmaltz left in the frying pan, and allow it to become crispy and golden as well. There can be many guacamole variations, so any of the below ingredients is optional except for the avocado of course. I have friends who do not like the taste of cilantro, so when they are coming for dinner I avoid using it, in the guacamole. Other friends don’t like spicy food so in this case I avoid using chili pepper. 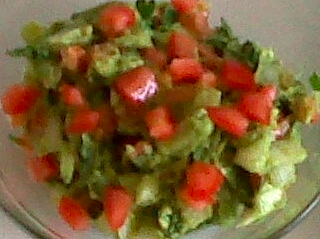 I don’t always add tomato to my guacamole, but for this recipe, I like the flavor and color it gives the dish. Mash the avocado and thoroughly mix in all of the other ingredients. Generously cover the surface of each tortilla chip with about 1 tablespoon of guacamole, top with gribenes and onions and accompany with your favorite Schnapps!